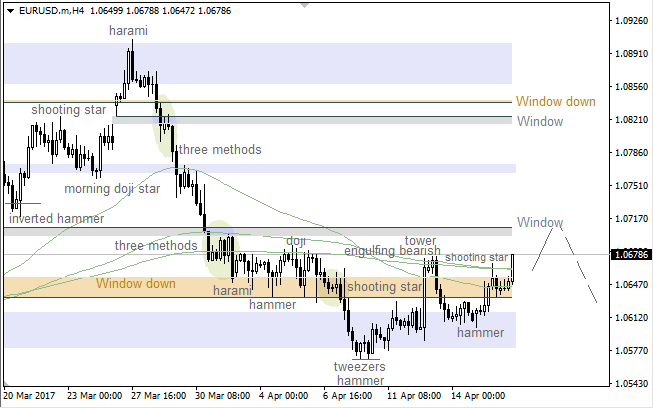 EUR/USD: bulls going to test "Window"
The “Window” and 34 Moving Average have been broken. There isn’t any bearish pattern, so the market is likely going to reach the nearest resistance soon. If any reversal pattern arrives afterwards, there’ll be an opportunity to have a downward correction. The last bullish “Hammer” led to the current upward price movement. Therefore, the upper “Window” is likely going to be tested during the day. Nevertheless, if a pullback this level happens, bears will probably try to deliver an intraday correction.